And yet, books needed to travel in the past, too. In fact, whether in their owner’s backpack, on wagons or in boats, medieval books were keen travelers. Longer works carried ideas across Europe, disseminating the sciences, spreading romances and passing on historical narratives. Short texts were committed to memory, by troubadours for example, but longer texts had to travel in the form of ink and parchment or paper. So, how did these treasures survive a long and arduous trip? Once again, Erik Kwakkel of Leiden University provides us with some fascinating insights on Medieval modes of book transportation. The book box is probably the sturdiest and most effective means to protect your book against the elements and other hostilities on the medieval road. Such boxes were usually made out of wood, to which ornaments, gems, and even ivory cuttings were attached, commonly with nails. The box on the right contains a famous book of hymns from St Gall, which was designed to be carried in processions both within the monastery and through the nearby city of St Gall. Decoration on the outside of the book box not only made the object look pretty, it also gave it prestige. In fact, ivory cuttings and shiny gems reflected the importance the book had within a monastic community or a church. Book boxes actually bear a striking resemblance to medieval reliquaries, shrines or containers made for holding a relic such as the arm of a saint or a splinter of the holy cross. The satchel was another means to carry your book around in the medieval outdoors. 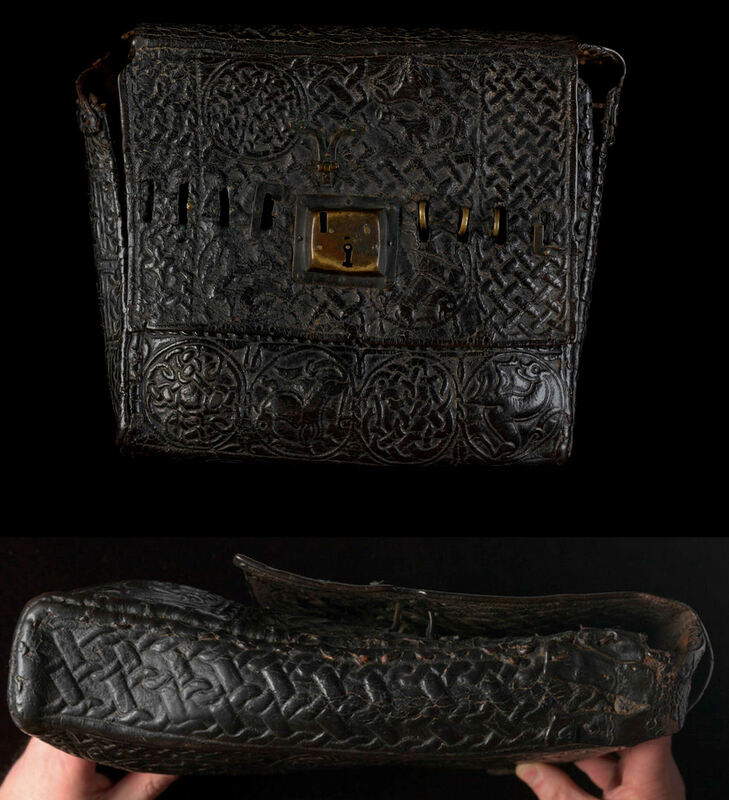 They were made of leather and commonly decorated in the manner seen in the famous 9th-century Book of Armagh – which, curiously, has a modern lock. Very few such satchels survive but we get an inkling of their use and popularity through medieval texts. A seventh-century tract instructs monks to “Hang your white booksacks on the wall, set your lovely satchels in a straight line”. It suggests that each member of this particular community owned a satchel. 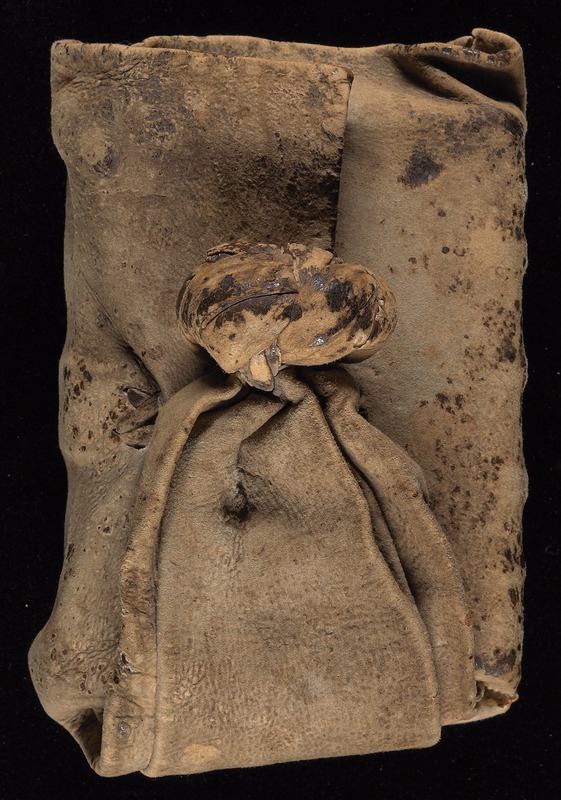 The same text also explains from what animal the leather came (sheep) and how the skin was turned into a bag: take a square piece of leather, sew it closed except for a single opening, which should be closed by a cover fitted with knobs. If you wanted to carry your, say, prayer book on your body instead of in a box or bag, the girdle book was your device of choice. The binding of these books came with a wrapper, which kind of flows from the leather of the binding itself. It allowed the user to wrap the manuscript into the leather, producing a watertight package. A knot was attached to the end of the wrapper. The carrier of the book slipped it under his belt so he could carry the book on his body. The book on the right was written in England during the fifteenth century and measures only 100×80 mm (a little bigger than a credit card) and contains Boethius’ Consolation of Philosophy, a sixth-century text discussing such topics as free will, virtue, and justice; an unusual choice for a girdle book. 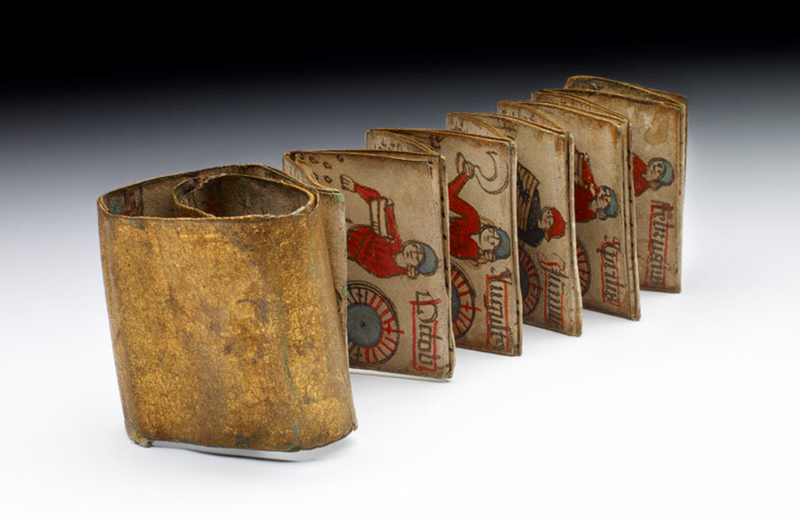 Most of these girdle books are small and light objects, which made it easy to dangle the package from your belt. The size may surprise us, but there was a practical concern here: attaching too heavy a book to your belt meant there was a good chance the book’s weight brought down your pants! To keep size small, scribes had come up with a few innovations of their own. As Erik Kwakkel explains, they might fold a book’s pages, as in the almanac featured below, which provides six times more writing/reading space in its expanded form. Another type of expandable manuscript is the accordion book. Below is an illustrated calendar made in Denmark in 1513. While in its folded state the object is as small as a matchbox, it expands to a full page of considerable proportions, comparable to a regular-sized medieval book. Accordion books are very small portable objects, but their surface can increase by an astonishing factor of ten. Curiously, this calendar has a most unusual way of unfolding: sections of the sheet expand independently, like little flaps from a pop-up book (note the “incisions” on the right half of the object). The most common and oldest expandable bookish object is the roll. This object probably held the most information in relation to its dimensions. Rolls had been in use for a long time when the book finally came around in the fourth century, and during the Middle Ages the roll format remained in use longest in administration. It was not until the late thirteenth century, for example, that cities in North-West Europe switched to the book form to write down their income and expenses – the city of Bruges still used rolls for this purpose in the 1280s. Rolls can be quite long. 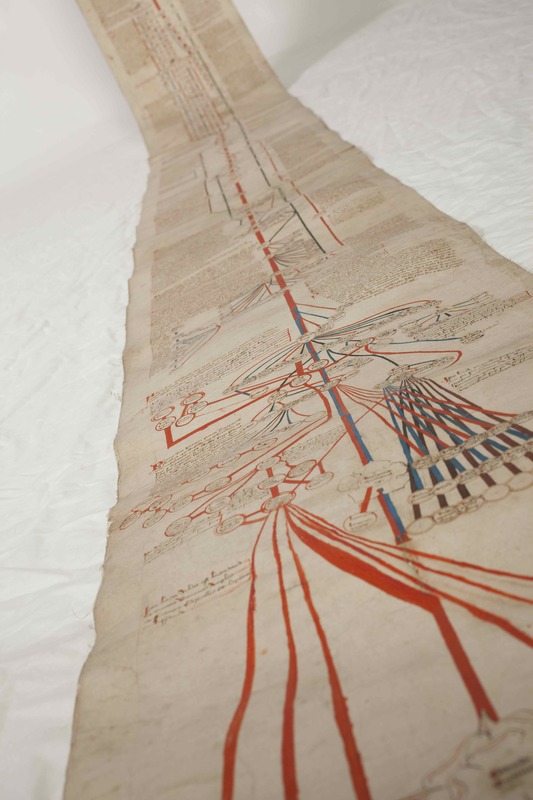 One of the longest that survives from the medieval period is a mortuary roll that was carried to 253 monasteries, nunneries and cathedrals across England and France during the 1110s. Mortuary rolls were produced to commemorate the death of a prominent person, in this case Abbess Mathilda of Holy Trinity Abbey in Caen. Like writing a joint birthday card today, clerics in France would add their say to the roll, which grew and grew, until it finally reached a length of 22 meters (72 feet). 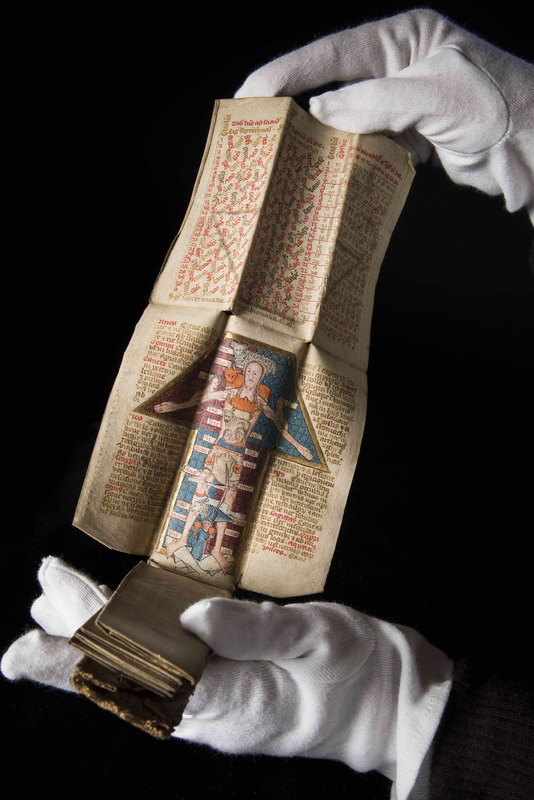 Rolls could either be transported as, well, rolls, but they could also come rolling out of a book, as in the fourteenth-century example below, which uses a book as its sleeve. The end of the roll (again holding a calendar) is simply pasted onto the book. The full roll measures an astonishing 130 cm (a little over 4 feet). 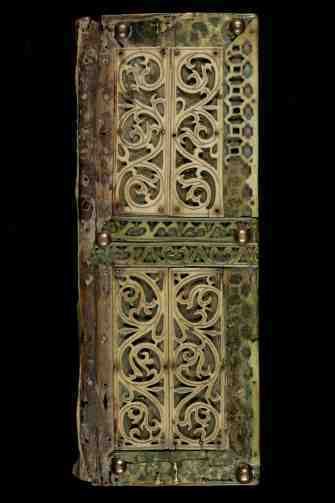 My next post deals with a special kind of travelling books: the Irish cumdach, or book shrines. 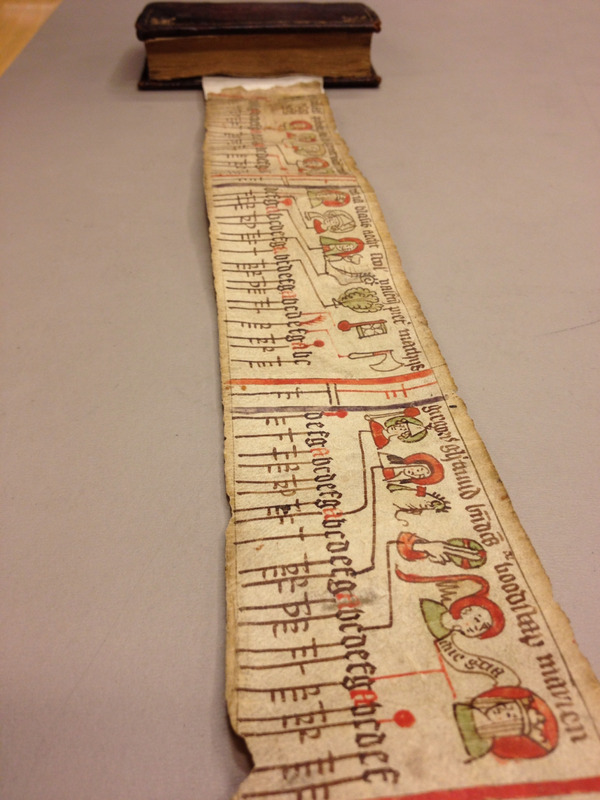 You can find out more on transporting Medieval books on Erik Kwakkel’s Medieval books blog. Great post! 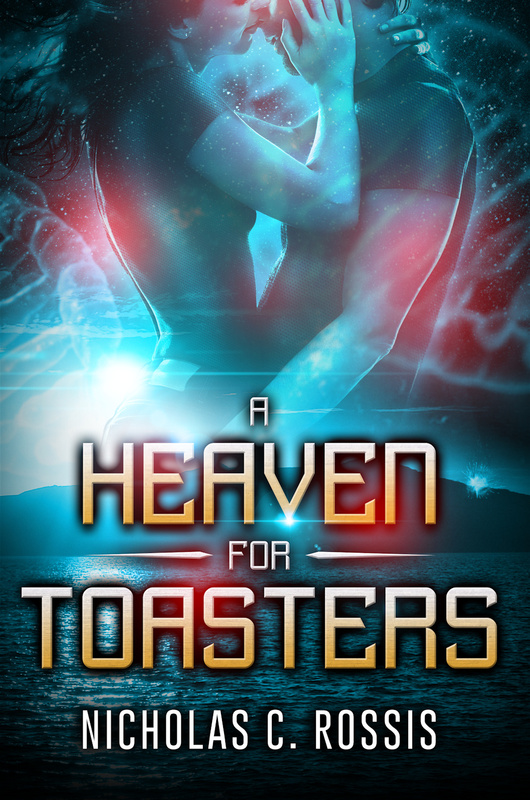 I’d love to reblog this, but the WordPress button doesn’t seem to work for me. It asks for my blog address, but when I enter it, I get an error message saying there’s nothing there, even though the page comes up. 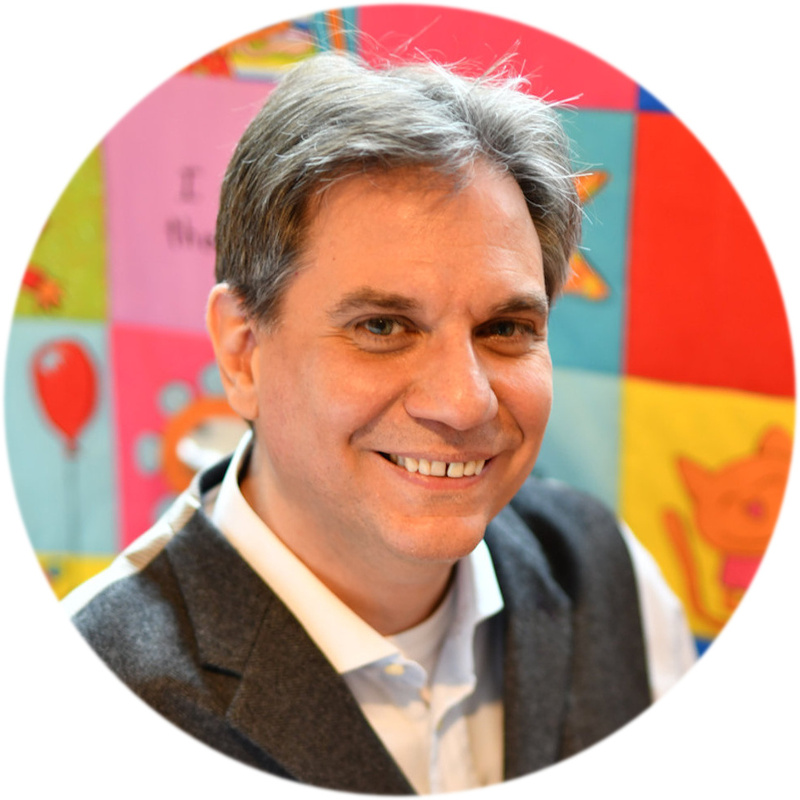 You used to have another link to try if the wordpress button didn’t work, but I can’t find that anymore. Help? The link is at the bottom of each post. Just go to http://nicholasrossis.wordpress.com and reblog from there. Fascinating! I’m really intrigued by how well those folded books have held up. So clever, too! Amazing facts about books! Thanks & Happy New Year! This gives me an idea, thanks!! How fun to know… thanks for sharing! They were all much nicer ways to transport books than on an e-reader, undoubtedly. Only if you had servants to do the carrying though. Ah, yes, a simpler time, with plenty of servants to go around! Although I’m not sure you’d trust such a precious item to a peasant lad.